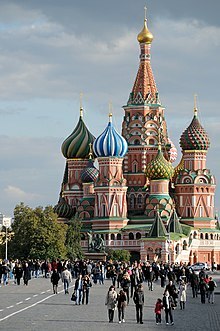 Moscow (/ˈmɒskoʊ, -kaʊ/; Russian: Москва́, tr. Moskvá, IPA: [mɐskˈva] ( listen)) is the capital and most populous city of Russia, with 13.2 million residents within the city limits, 17 million within the urban area and 20 million within the metropolitan area. Moscow is one of Russia's federal cities. Moscow has different vehicle sharing options that are sponsoed by the local government: there are several car sharing companies (Karshering) which are in charge of providing cars to the population. To drive the automobiles, the user has to book them through the app of the owning company. In 2018 the mayor Sergey Sobyanin said Moscow's car sharing system has become the biggest in Europe in terms of vehicle fleet. Every day about 25,000 people use this service. Another sharing system is bike sharing (Velobike) of a fleet formed by 3000 traditional and electrical bicycles. The Delisamokat is a new sharing service that provides electrical scooters. There are companies that provide different vehicles to the population in proximity to Moscow's big parks. ^ "Three Moscow Metro stations designated architectural landmarks". Moscow City Web Site. 2018-01-18. Retrieved 2019-02-24. ^ a b c d e f g Vasmer, Max (1986–1987) [1950–1958]. "Москва". 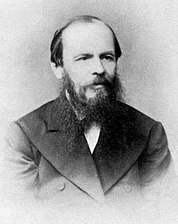 In Trubachyov, O. N.; Larin, B. O. Этимологический словарь русского языка [Russisches etymologisches Wörterbuch] (in Russian) (2nd ed.). Moscow: Progress. ^ "Early East Slavic Tribes in Russia". Study.com. Retrieved 2018-12-10. ^ "Moskov Surname Meaning, Origins & Distribution". forebears.io. Retrieved 2018-12-10. ^ "Moscow becomes the capital of the Soviet State". Presidential Library. 2018. Retrieved 2019-03-12. ^ "Thermograph.ru averages". Retrieved 2011-01-12. ^ "Pogoda & Climate (Weather & Climate)" (in Russian). Retrieved 2011-01-12. ^ "Climate monitor 2005-2011" (in Russian). Retrieved 2011-01-12. ^ "Average monthly Sunshine hours" (in Russian). Meteoweb.ru. Retrieved 2011-01-12. ^ "VVC info" (in Russian). Retrieved 2018-04-03. ^ "Russian Ministry of Culture official statistics". Archived from the original on 2015-07-02. ^ "Brno – Partnerská města". Brno.cz (in Czech). Retrieved 20 May 2018. ^ http://chicagosistercities.com. "Sister Cities". chicagosistercities.com. Archived from the original on December 24, 2015. ^ "Moscow and New Delhi twin cities strengthen friendly ties". Sep 7, 2012. Retrieved August 3, 2016. ^ "Partner cities". Yerevan Municipal Government. Retrieved 2018-04-18. Nizhny Novgorod, colloquially shortened to Nizhny, is a city in Russia and the administrative center (capital) of Volga Federal District and Nizhny Novgorod Oblast. From 1932 to 1990, it was known as Gorky, after the writer Maxim Gorky, who was born there. The Moscow Metro is a rapid transit system serving Moscow, Russia and the neighbouring Moscow Oblast cities of Krasnogorsk, Reutov, Lyubertsy and Kotelniki. Opened in 1935 with one 11-kilometre (6.8 mi) line and 13 stations, it was the first underground railway system in the Soviet Union. As of 2018, the Moscow Metro excluding the Moscow Central Circle and Moscow Monorail has 224 stations and its route length is 381 km (237 mi), making it the fifth longest in the world. The system is mostly underground, with the deepest section 84 metres (276 ft) underground at the Park Pobedy station, one of the world's deepest. It's the busiest metro system in Europe, and a tourist attraction in itself. The city of Moscow gradually grew around the Moscow Kremlin, beginning in the 14th century. It was the capital of the Grand Duchy of Moscow, from 1340 to 1547 and in 1713 renamed as the Tsardom of Russia by Peter I "the Great". 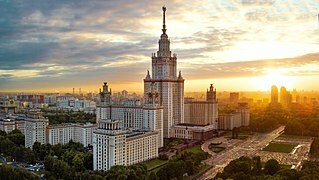 Moscow was the capital of the Russian Soviet Federative Socialist Republic from 1918, which then became the Soviet Union, and since 1991 has served as capital of the Russian Federation. 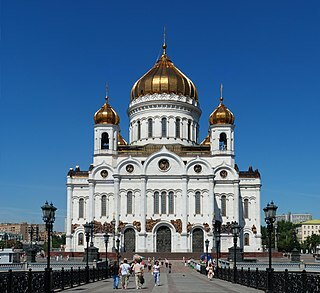 The Cathedral of Christ the Saviour is a Russian Orthodox cathedral in Moscow, Russia, on the northern bank of the Moskva River, a few hundred metres southwest of the Kremlin. With an overall height of 103 metres (338 ft), it is the tallest Orthodox Christian church in the world. Vnukovo International Airport, is a dual-runway international airport located 28 kilometres (17 mi) southwest of the centre of Moscow, Russia. It is one of the four major airports that serve Moscow, along with Moscow Domodedovo Airport, Sheremetyevo International Airport, and Zhukovsky International Airport. In 2015, the airport handled 15.82 million passengers, representing an increase of 24% compared to the previous year. It is the third-busiest airport in Russia. Stalinist architecture, mostly known in the former Eastern Bloc as Stalinist Empire style or Socialist Classicism, is a term given to architecture of the Soviet Union under the leadership of Joseph Stalin, between 1933, when Boris Iofan's draft for Palace of the Soviets was officially approved, and 1955, when Nikita Khrushchev condemned "excesses" of the past decades and disbanded the Soviet Academy of Architecture. 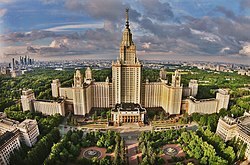 Stalinist architecture is associated with the socialist realism school of art and architecture. The Sokolnicheskaya line is a line of the Moscow Metro. It opened in 1935 and is the oldest in the system. There are currently 22 stations open on the line. As of 2016, the line is 32.5 kilometres (20.2 mi) long. 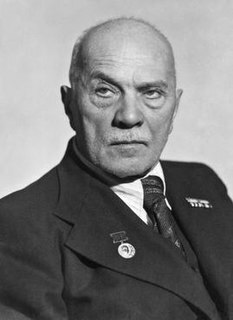 Alexey Viktorovich Shchusev was an acclaimed Russian and Soviet architect whose works may be regarded as a bridge connecting Revivalist architecture of Imperial Russia with Stalin's Empire Style. Metro-2 is the informal name for a purported secret underground metro system which parallels the public Moscow Metro. The system was supposedly built, or at least started, during the time of Joseph Stalin and was codenamed D-6 (Д-6) by the KGB. It is supposedly still operated by the Main Directorate of Special Programmes (ru) and Ministry of Defence. The Moscow Automobile Ring Road, or MKAD (МКАД), is a ring road encircling the parts of the City of Moscow, the capital of Russia. The length of the road is 108.9 km (67.7 mi), and the number of exits is 35. The Lyublinsko–Dmitrovskaya line is a line of the Moscow Metro. It was known as "Lyublinskaya line" before 2007. First opened in 1995 as a semi-chordial radius it is at present in process of being extended through the centre and northwards. At present the line has 34 kilometres of track and 23 stations. Arbat Street, mainly referred to in English as the Arbat, is a pedestrian street about one kilometer long in the historical centre of Moscow, Russia. The Arbat has existed since at least the 15th century, which makes it one of the oldest surviving streets of the Russian capital. It forms the heart of the Arbat District of Moscow. Originally the street formed part of an important trade-route and was home to a large number of craftsmen. The Third Ring Road, or The Third Ring, is a beltway around central Moscow, Russia, located between the Garden Ring in the city centre and the Moscow Ring Road (MKAD). Yakimanka District is a district of Central Administrative Okrug of the federal city of Moscow, Russia. Population: 26,578 (2010 Census); 22,822 (2002 Census). Izmaylovo District is a district in Eastern Administrative Okrug of the federal city of Moscow, Russia. Population: 102,837 (2010 Census); 110,099 (2002 Census). The Moscow transportation network uses buses, trams, subway system, motorways, trains, helicopters and planes to provide connectivity between Moscow's districts and beyond.